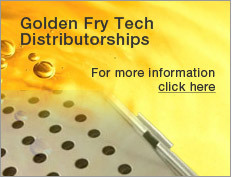 Through Golden Fry Tech's (GFT) revolutionary technology, the oxidation process is reduced and the lifespan of cooking oil is dramatically increased. Recent tests have proven that GFT can cut oil costs in half by extending the lifespan of cooking oil by 50 to 200%. Due to lower oil absorption rate by food cooked utilizing the GFT technology, food is lighter, crispier and healthier. Tests have proven that GFT can reduce calories in fried foods by up to 50%. By utilizing GFT, fried foods taste fresher and more full of its own natural flavor.